BELLE PLAINE, Minn. (CNS) — A black cube with Satanic symbols and an offering bowl has been proposed for Belle Plaine’s Veterans Memorial Park. And the town’s Catholics don’t want it there. Father Brian Lynch, pastor of Our Lady of the Prairie Parish, gathered for prayer in the park in June with more than 50 Catholics. Two days later, about 40 Catholics joined Father Lynch as he testified against the proposed monument before the Belle Plaine City Council. Meanwhile, more than 30 Catholics, including members of the Archdiocese of St. Paul and Minneapolis’ Catholic Watchmen initiative, attended Mass and prayed in eucharistic adoration at the parish. “Sometimes these things which are evil can really, maybe, wake some people up. We really have to take our faith seriously and live it,” Father Lynch told The Catholic Spirit, newspaper of the Archdiocese of St. Paul and Minneapolis. Commissioned by the Massachusetts-based Satanic Temple, the proposed monument consists of a 23-inch-by-23-inch steel cube engraved with inverted pentagrams on each side. On top of the box sits an upside down soldier’s helmet, which memorializes fallen soldiers and serves as an offering bowl. The Satanic Temple describes the bowl as a place for visitors to leave cards or flowers, but also calls it a “Baphometic” bowl, relating it to an occult idol that has roots in medieval paganism. “It feels like it’s being imposed on us from the outside,” Father Lynch told The Catholic Spirit, archdiocesan newspaper. Located 45 miles southwest of Minneapolis, Belle Plaine — population 6,400 — attracted the Satanic Temple’s interest after accommodating the placement of another monument that included a cross in a public park. 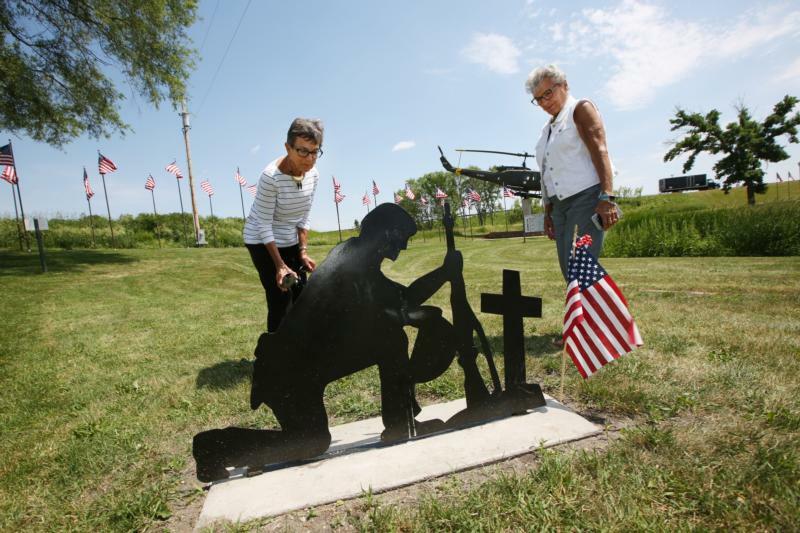 Joseph Gregory, an 87-year-old Army veteran and Belle Plaine resident, made an iron silhouette of a soldier holding a gun and kneeling by a cross grave marker that the Belle Plaine Vet’s Club placed in the city’s Veterans Memorial Park last August. Gregory died in October. A Freedom From Religion Foundation member in Belle Plaine considered the statue too religious for public land, so she reported the issue to police, according to Alpha News, a Minnesota media outlet. The foundation persuaded the City Council to have the cross removed and the vet’s club did so Jan. 17. Veterans and citizens crowded a February City Council meeting to ask for the cross’ return. Council members voted 3-2 to form a limited public forum area in the park, which allowed the cross to be displayed again. The designated space permits anyone of any religion to apply to place a memorial. The Satanic Temple learned about the opportunity to place a monument in Belle Plaine through the foundation, which also hopes to place a memorial in the park. Annie Laurie Gaylor, foundation co-founder, said her organization’s memorial aims to honor “atheists in foxholes and other free-thinkers who have served their country with valor and distinction.” She said a quarter of the U.S. military is not religious and the same percentage of the organization’s 29,000 members are veterans. “We really do embrace the opportunity to put up a memorial tribute to veterans in their honor,” Greaves said. The Belle Plaine monument would be its first veterans’ memorial. Jason Adkins, Minnesota Catholic Conference executive director, said the question of the memorial’s placement is both a freedom of speech issue and one of religious freedom, both of which have legitimate limits. “With rights come responsibilities,” he said. “You can’t yell ‘fire’ in a crowded theater” if there isn’t one. As for religious freedom, the government can have a “compelling” reason to set limits when a practice violates the common good, Adkins said, giving the example of two Michigan doctors in court for performing female genital mutilation on two Minnesota Muslim girls for religious reasons. For Catholics, Satan isn’t simply a symbol of evil. The Catechism of the Catholic Church states that Satan is a spiritual creature who was created as an angel, but who rejected God and “fell” from heaven. Father Mark Dosh, a retired priest in St. Anthony, who has studied exorcism through the Institute for Priestly Formation in Omaha, Nebraska, said the community must respond to a Satanic memorial as they would any offensive material.